Radio St Austell Bay (RSAB) is a community radio station. We broadcast 24 hours a day on 105.6FM to the St Austell Bay area and also stream our broadcasts to the Internet from our website, www.rsab.org. This means that listeners, globally, can hear their favourite shows and keep up to date with local events. 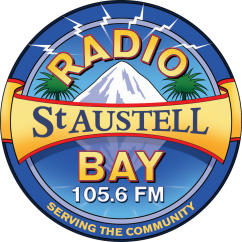 “Radio St Austell Bay, 105.6 FM, www.rsab.org, is a volunteer-run radio station. We aim to position ourselves at the heart of our community by being responsive to local issues; showcasing and championing local talent, artists, schools, charities, community groups and enterprises. We seek to focus on local matters with an eye to encouraging and welcoming St Austell's interaction with the wider world. Radio St Austell Bay aims to serve the wide range of ages, abilities and interests of people in the community. We enable local people, community groups, charitable, social and voluntary organisations to learn how to promote themselves through the medium of community radio. As a non-profit making Community Interest Company we have no shareholders. The radio station is run by volunteers who wish to do something positive for the St Austell area; allowing people the opportunity to promote events, keep residents up to date with community information and to give local, national and international artists and bands the springboard they need. We offer free radio and journalism, office skills and project management training to project groups, schools and colleges and provide invaluable voluntary placements that help boost self-confidence and life skills. It costs us between £10,000 and £12,000 per year to run Radio St Austell Bay, 24 hours-a-day, 365 days a year. This covers our license, copyright fees, administrative and transmitter running costs. Your support makes a big difference to us. We’ll thank you by letting St Austell residents know that you care about the town and we’ll make sure your message gets heard. Ofcom only allow up to 50% of our income to come from advertisers. That means your business will definitely stand out as we won’t be airing wall-to-wall adverts!